When the Monday morning headlines are sprinkled with reports of weekend boating accidents from around the country, you know it must be getting closer to boating season. This morning we woke up to several disturbing stories in the news, including a capsized 35' sailboat off San Diego that left two dead, and a few more incidents in Florida. According to sandiego6.com, a 35 ft sailboat capsized Sunday afternoon near Shelter Island after rolling over. Of the nine people on board, two are dead and the other seven are injured. WSVN.com reported that there was a fishing boat vs. speed boat crash in Miami Beach on Friday night, and several people were brought to the hospital. 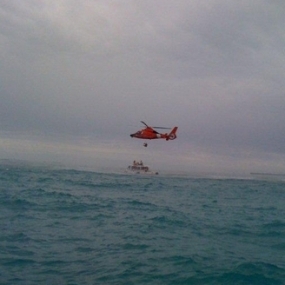 In Tampa Bay, two men were rescued by the Coast Guard from a sinking Hobe Cat, about three miles off shore. ABCActionNews.com reported that the incident happened on Sunday, but in an update on Monday Morning, the Coast Guard is warning local mariners to be on the lookout for the vessel until it is recovered. Rounding out the trifecta in the Sunshine State, Jacksonville.com reported this morning that two boaters were found safe this morning on their disabled bass boat. The boaters were reported missing overnight when they did not return from a Sunday fishing trip, which they started at a boat ramp in Yulee near Plummer Creek. According to the Coast Guard, the boaters had a cell phone, but it died; otherwise, the boat was not equipped with the proper emergency equipment, e.g., a VHF radio, safety beacon, etc. It's not too late to find a safety course and brush up on your boating skills before the season gets into full swing this year. Organizations that offer boating safety courses, as well as our basic boating safety tips can be found on the FirstBoat boating safety page.